You can start your own business online today. Yes you can. At no time has starting a business been as easy as it is today. The internet has actually changed the fundamentals of doing business, but many are yet to realize this, and hence still live in self-imposed limitations. The things that used to distinguish the big business tycoons from starters are readily available to you today with a click of the mouse. But you have to click the right place. Do you know that some of the top businesses like Google, Facebook, Amazon, eBay, Yahoo etc started only few years ago? ; some by students, have you wondered why some of them grew so rapidly from school projects to international businesses worth billions of dollars? The truth is that the internet puts the WORLD in your palms. If you have access to the internet, you can start your own international business now. If you start your own business online, you can easily overcome these challenges. Raising Capital - This is one of the major challenges of small businesses. Traditionally to start your own business, you need funds to build or rent an office, equip and furnish the office, source for raw materials, get supplies etc. Advertising/Marketing Your Products and services - Most new businesses face the challenge of breaking into the market. This is because people are more comfortable with existing/big brands and products. In order to break into the market, a number of new businesses in the offline world spend much funds on adverts and marketing. You can start your own business online and rise above this challenge easily. People mostly go to the internet in search of information, and even if they are visiting your site for the first time they can develop trust in you if they find quality and relevant information in your site. When people trust you they will certainly buy from you. Leaving Your Secure Job – Most people on paid jobs have dreams of having their own businesses but the fear of leaving their secure jobs to face the uncertainties of a new business deters them. Starting an online business can be done conveniently on part-time. You can start your own business online without leaving your paid job hence avoiding the uncertainties that scare you. You can start with your evenings after your regular work or weekends or even during your vacation. Then what are the challenges of starting and doing business online? Why do many online businesses still fail? The success of your business online actually depends on the following…. Your understanding of the fundamentals of doing business online especially as it differs from the traditional way of doing business offline. AND HERE IS THE GREAT NEWS! There is One System that provides all the above and more for you - SBI. 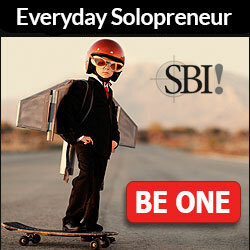 SBI is an all-in-one system of processes, tools and software that offers you everything about building an ebusiness. Yes SBI offers you everything about starting your business online. SBI is not just about site building or blogging, it builds real and lasting businesses. You don’t need any technical skills. If you can browse or check your email, you can use SBI. THEN WHAT IS YOUR CONTRIBUTION? then be willing to diligently follow the SBI guidance. WHAT ARE THE RISKS OF USING Solo Build It?